"I think the vision plan is very bold"
Larimer has hundreds of empty lots — only these lots were repurposed as the Larimer Community Garden. Community volunteers stand before its 40 raised beds. The low-income, mostly African-American community adjacent to East Liberty is easily overlooked. Many Pittsburghers may think of it as "that neighborhood behind Target" — if they think of it at all. Thanks to a 90 percent population loss in recent decades, and the demolition of abandoned houses, about 40 percent of Larimer consists of vacant lots, according to the University of Pittsburgh's Pittsburgh Neighborhood and Community Information System. Observers might regard those empty properties as blight. But in 2007, when Larimer began crafting a revitalization plan, many residents saw the lots as an asset, the defining feature of a neighborhood that wasn't half-empty but half-full. And so they proposed making Larimer a "state-of-the-art green community." In the "vision plan" they devised, Larimer would be literally green: bounded by new parkland and playing fields, its streets lined with trees. And it would be functionally green, with everything from an urban farm to energy-efficient new buildings. The plan is ambitious; there might not be another one in the region like it — certainly not in a neighborhood so touched by poverty. 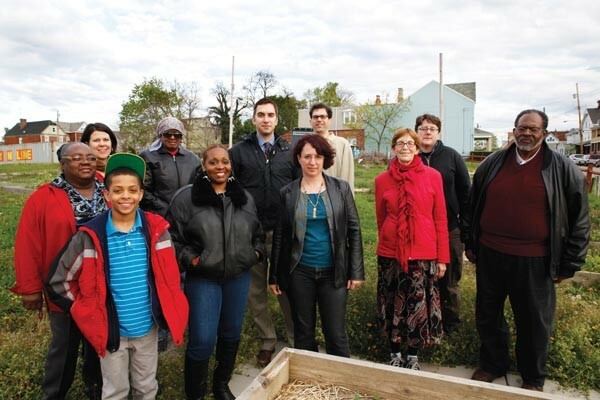 Yet Larimer has already seen tangible results, including a community garden. Moreover, this year Larimer became the first city neighborhood to join the Transition Town movement, a global effort to help communities thrive in a future altered by climate change and dwindling oil supplies. As Carolyn Peeks, one of Larimer's busier activists, puts it, "Larimer's got it going on." Still, much of Larimer's green vision remains on paper. And its biggest asset — the supply of open space — might also pose one of the biggest challenges to realizing its goals. Beautification efforts along Larimer Avenue include this painted bench on the site of the community garden. Peeks, 56, helps lead the Larimer Consensus Group, the umbrella organization guiding renewal efforts. 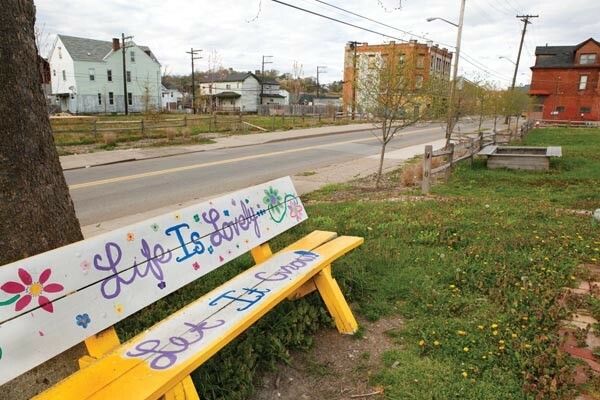 The UPMC administrator and longtime neighborhood resident participates in both Larimer's fledgling Transition Town initiative and its portion of the Urban Green Growth Collaborative, which works with inner-city residents across town. She also captains the Larimer Green Team, which does beautification projects and manages the community garden. Larimer needs the help. The neighborhood of just 1,700 has a poverty rate nearly double the county average. A quarter of its remaining houses stand vacant, and it's isolated by the ravines of Negley Run Road and Washington Boulevard, and half-hidden by a retail and light-industrial zone along Penn Avenue. Peeks was one of about 130 people attending a March 29 meeting, held at the Kingsley Association community center, billed as the kickoff for a "vision to action" planning process. Within one year, the community must craft a plan for implementing its vision plan in order to qualify for up to $30 million in federal redevelopment funds. Residents were joined by representatives of state legislators' offices, city officials and community-development groups. The plan's green aspects reflect concerns about the neighborhood's empty lots. The ideas were shepherded by leaders including Fred Brown, Kingsley associate director of development. The former high school teacher and juvenile-probation officer promotes community self-sufficiency, and the notion that Larimer can strengthen itself through green jobs. The vision plan would remove buildings from Larimer's lightly populated northern and western borders, turning those areas into parkland and playing fields, with a village green and urban farm. Larimer, flat as a pancake, is ideal for all those uses. No one would be kicked out, says Brown; instead, they'd be moved to new homes in Larimer's interior, creating a more vibrant core. The plan also calls for a revived retail district and "green" light-industrial development. "The vision plan is very bold," says Chris Koch, a co-founder of GTECH, a nonprofit seeking green solutions to urban issues. "I love the idea that they're bringing this to Larimer, because often the [redevelopment] conversation is, ‘Where do we put the buildings?'" Ultimately, though, the vision goes beyond green space. "Our overarching goal," says Brown, is "to take [Larimer] off the grid" by making use of wind turbines, geothermal energy, rainwater collection, solar farms and more. "Can we create enough energy in our community that it zeros out [by powering itself]?" Larimer already looks different than it did a few years ago. Along Larimer Avenue sit the 40 raised beds of its community garden. Half are rented by neighbors, and the others have produced tomatoes, kale, squash, sweet potatoes and more. When harvested vegetables were offered free to community members at the Kingsley Center, says Peeks, "They were gone by the end of the day." The most recent addition to Larimer Avenue is the Energy and Environment Community Outreach Center. It's a small "green" building built by Pittsburgh Community Services Inc., an anti-poverty group using it to train residents in lowering their energy usage and preparing for "green-collar" jobs. Employment matters, Brown observes, because people who are hungry are unlikely to worry about saving the planet. Other initiatives to grow a green-collar workforce include Kingsley's energy-auditor program. "People are gonna have to retrofit their homes to make them greener," says Brown. In January, with funding from the Heinz Endowments, classes began for 18 trainees who'll help homeowners reduce their energy usage, with renovations partly financed by federal tax credits. More initiatives are planned. The Green Team is redesigning the long-neglected first four blocks of Larimer Avenue north of East Liberty Boulevard, a neighborhood entry point. One part of that project, in collaboration with GTECH, will create a rain garden in a vacant lot adjoining a laundry. Such gardens are a green way to handle stormwater runoff, rather than letting it flow into overtaxed sewers — or onto flood-prone Washington Boulevard. Meanwhile, neighbors are racing to complete the vision-to-action plan launched March 29. Action groups formed that night, focusing on everything from housing and education to community spirit, and began meeting the very next week. Larimer, in short, could serve as a model for other neighborhoods. Brown himself is one of only 22 official Transition trainers in the whole country, and in January, he helped lead a training session launching Larimer's Transition Town initiative. The session drew three dozen participants, and of the 80 Transition U.S. trainings conducted so far, Larimer's was the first to consist primarily of African Americans. As Brown noted, Larimer was already doing lots of things the Transition movement encourages, like planning, at a community level, for life without fossil fuels. Justin Thakar, a spokesperson for the umbrella group Transition Pittsburgh, agrees. The Pitt junior has become a regular at Larimer meetings, taking notes on how things get done there. What's happening in Larimer, he says, is "one of the more hopeful things in Pittsburgh." What are the odds of Larimer realizing its vision? It might depend on how you interpret what the vision is. Transition Town, for instance, foresees a future without fossil fuels, where long-distance transport of goods is rare. At Larimer's Transition workshop, participants spoke admiringly of the Amish lifestyle. But at the March 29 vision-plan meeting, speakers touted more conventional development efforts. "My goal is to see the [area] redone and built up" from the commercial development Bakery Square on out, said Pittsburgh City Councilor Ricky Burgess. Another speaker cited the new Target approvingly, and to general applause. An observer might be forgiven for experiencing some cognitive dissonance. Visions of sustainability like Transition's can incorporate many elements, but big-box stores selling goods made half a world away aren't usually among them. Then there's the issue of real estate. East Liberty, with its Whole Foods and influx of trendy restaurants, is gentrifying. The national developer McCormack Baron Salazar has sunk $20 million into the first phase of the Fairfield Apartments, 124 units built at Larimer's doorstep. So just how long until a half-empty, perfectly flat little community — one that fills the gap between East Liberty and Highland Park — becomes a real-estate hot spot? Burgess, who chairs the Housing Authority of the City of Pittsburgh board of commissioners, was instrumental in obtaining HACP funding for Larimer to complete its vision plan. But he emphasizes that realizing that plan depends on "what the market will bear." Moreover, nearly half of Larimer's 700 vacant parcels of land are owned by public entities, including the HACP. Such entities usually want land returned to the tax rolls, not turned into parks. If the community says "park" and the developer says "townhouse," which future will government pursue? Indeed, such choices are sort of how HACP got involved in the Larimer planning process. "We heard, ‘They're developing a vision plan that calls for a park on your land,'" says David P. Weber, who represents HACP in Larimer, where the authority owns about nine acres. Much of that acreage formerly hosted high-rise apartments. Even if a park is feasible, Weber says, HACP will seek to replace the high-rise's 275 units nearby. Brown acknowledges that real-estate speculation in Larimer is a risk. He says the community is seeking to start a land bank, acquiring properties to assure they are used in accordance with the vision plan. Still, if the alternatives for Larimer are either changing how people live or else simply learning to survive within the existing regime, Brown says a neighborhood so close to the edge must do both. "It's not this or that, in my mind," he says. "It's this and that." Larimer, he says, still needs investment from government agencies and corporations who might not yet share all of its vision. "They're looking at the here and now, we're looking at the future," he says. "Our goal is, how can we make that green?"